Major repairs to the Church of the Nativity are lifting spirits in the town of Bethlehem just before Christmas. Many Christians around the world celebrate Christmas on December 25. That is the day they believe Jesus was born. Many believe the Church of the Nativity was built on the site where Jesus was born. Bethlehem city officials hope the repairs to the church will bring in more visitors and improve the weak economy in the West Bank. They also hope the repairs might help keep more Christians in the area. Bethlehem Mayor Anton Salman told the Associated Press that Christians are leaving the area, known as 'the Holy Land,' because of conflict and economic difficulties. Repairs to the Church of the Nativity started in 2013. That came a year after the United Nations Educational, Scientific and Cultural Organization, or UNESCO, declared the church a world heritage site. 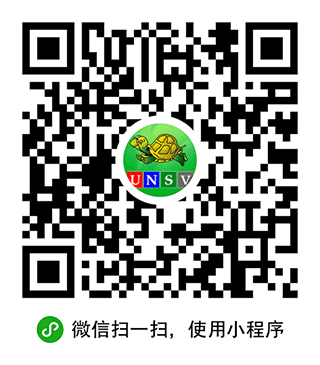 The repairs are expected to be completed by the end of next year. The Palestinian Authority, which governs the territory, formed a committee of local Christian leaders to lead the project. They also employed an Italian company to carry out the repairs. 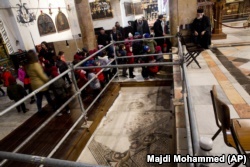 In this Thursday, Dec. 6, 2018 photo, visitors walk by a repaired part of a mosaic inside the Church of the Nativity. Ziad al-Bandak is head of the committee. He said the group has collected $14 million out of $17 million needed. Almost half of the money has come from the Palestinian Authority, and local Muslim and Christian businesses. The rest came from foreign donations. The church is considered one of the holiest places in Christianity. It was built in the 4th century by Saint Helena over a cave where the Virgin Mary, Jesus's mother, is said to have given birth. The church was destroyed by fire and rebuilt in the 6th century under Byzantine Emperor Justinian I. For years there had been no repairs done to the building. The roof of the church was leaking, windows were broken, art was covered in dirt and walls and support structures were damaged. After five years of work, it has been completely changed. Emad Nassar is a Palestinian engineer with the repair project. He said the project started with the roof. Some of the roof supports were replaced with wood imported from old destroyed churches in Italy. Windows were fixed, and outside stones and walls were repaired. The biggest problem has been repairing the badly damaged 2,000 square meter wall mosaic. So far, 120 square meters have been cleaned, showing images of Jesus and other Christian figures. 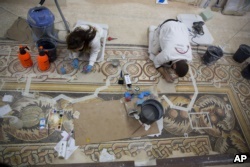 Workers are also repairing a floor mosaic. ​Why was the church left in such condition? Under a 19th-century agreement, the Roman Catholic, the Greek Orthodox and the Armenian churches have been responsible for their own areas of the church. Disagreements among the three Christian organizations have left the church in a state of disrepair. The Palestinian Authority has been credited with settling the dispute. But the repairs have not included the altar with the 14-point silver star that marks where Jesus was said to have been born. Bethlehem depends heavily on visitors around the Christmas holiday. Local hotels, restaurants and gift stores do much of their business during the short holiday season. The repaired church has become a popular destination. After dropping in 2015 and 2016, the number of visitors has risen in the past two years, officials say. The mayor said he expects 1.2 million visitors this year. Mohammed Daraghmeh wrote this story for the Associated Press. Pete Musto adapted this story for VOA Learning English. Hai Do was the editor. We want to hear from you. What affect do you think these repairs will have on the numbers of Christians living in the area? Write to us in the Comments Section or on our Facebook page.